Egyptian political satirist Bassem Youssef spoke to a sold-out audience at Stanford University on September 28, 2015--an event that was co-sponsored by the Center on Democracy, Development and the Rule of Law (CDDRL) and OpenXChange. The talk was moderated by Larry Diamond, former director of the CDDRL and senior fellow at the Freeman Spogli Institute for International Studies. 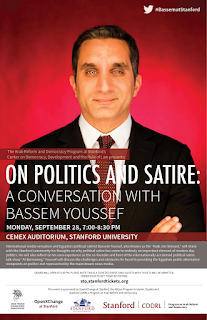 The political satirist, also known as the “Arab Jon Stewart,” shared with the Stanford community his thoughts on why political satire has come to embody an important element of modern day politics. He also reflected on his own experience as the co-founder and host of the internationally acclaimed political satire talk show “Al-Bernameg.” Youssef discussed the challenges and obstacles he faced in providing the Egyptian public alternative viewpoints on politics not represented by the mainstream news media. Named one of TIME’s “100 most influential people in the world” in 2013, Bassem Youssef is an Egyptian satirist, columnist, and talk show host. A cardiac surgeon by training, Youssef turned to comedy after he was inspired by the Egyptian revolution. He uploaded the first episode of his homemade newscast, “The B+ Show,” to YouTube in May 2011. After it garnered more than 5 million views in three months, Youssef was named the host of “Al-Bernameg,” a satirical newscast modeled after Jon Stewart’s “The Daily Show.” Youssef’s bold, intelligent, and humorous critiques of Egyptian politics quickly became a hit with audiences in the country and garnered more than 40 million viewers. In 2012, Mohamed Morsi’s government pursued charges against Youssef for "insulting the president," “insulting Islam," and “reporting false news.” In March 2013, Youssef was briefly detained, released on bail, and fined. CBC suspended the broadcast of “Al-Bernameg” in November 2013. In 2014, Youssef announced that he was ending the program due to the dangerous political climate in Egypt. In the spring of 2015 Youssef served as a resident fellow at the Institute of Politics at the John F Kennedy School of Government at Harvard University. He has recently been announced as the host of the International Emmy Awards gala of 2015. (Segment above taken from CDDRL's Web Site. See THIS LINK for more).